"Hey, we all agreed on this serious military theme!" "So? It's my turn, my choice. I say: NINJA!" 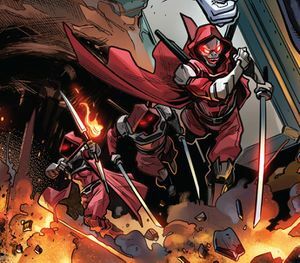 The Red Shadows are the remnants of the Arashikage ninja clan, the world's greatest assassins. Led by the ninja known only as Storm Shadow, they have allied themselves with Doctor X, who has enhanced their abilities with mechanical and biological augmentations. This page was last edited on 18 December 2017, at 17:22.